New this year was the early morning pancake eating contest. Youths filled their bellies with pancakes and syrup in an effort to take home winning trophies in the contest. 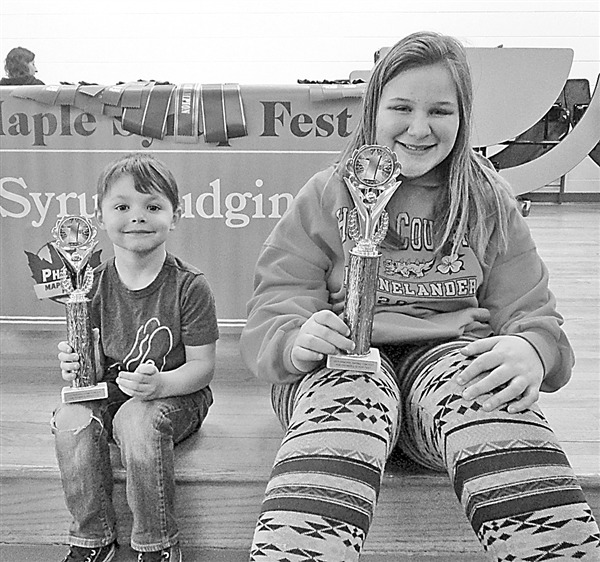 Winners of the children’s pancake-eating contest were 4-year-old Brady Kube of Eagle River and 11-year-old Samantha Guysick from Rhinelander. 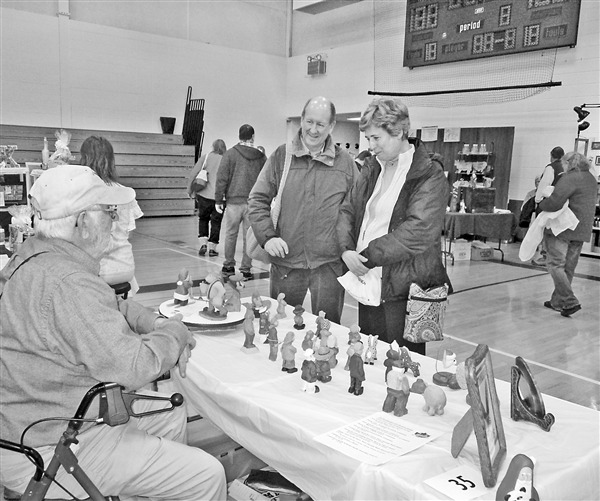 Shoppers at the Phelps Maple Syrup Fest had the opportunity to browse arts, crafts and foods from the more than 70 vendors Saturday. 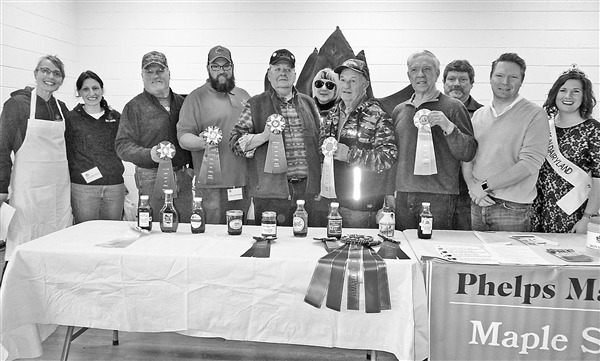 Judges and winners of the maple syrup contest posed with their ribbons and winning syrup submissions. Special guest judges included WJFW Meteorologist Geoff Weller and Alice in Dairyland Kaitlyn Riler (both on left end of photo). 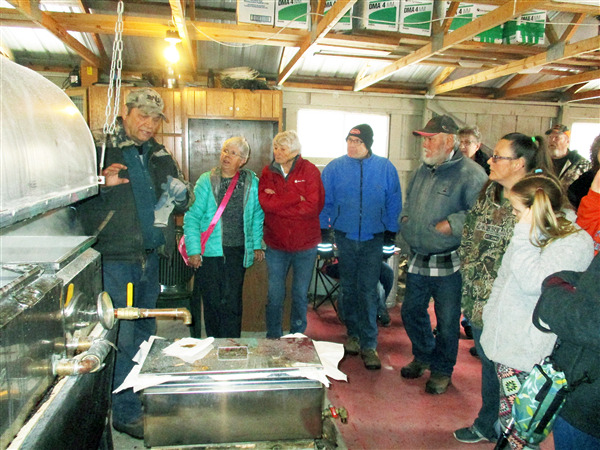 Despite the rainy weather, an estimated 4,000 people turned out to attend the eighth annual Phelps Maple Syrup Fest last Saturday. The day’s events included bus tours of local sugar bushes, a maple syrup contest, demonstrations, pancake-eating contest, beekeeping and educational classes, maple-based food offered at the Maple Café, more than 70 craft vendors, children’s activities and raffles. Mike Dodge from Friess Lake Maple Products was the 2019 Maple Syrup Fest champion, and he also placed first in the dark syrup category. First place in the amber category went to Ski Sugar Shack and first in the golden category was awarded to Paramski Family Syrup. A total of 30 syrups were entered into the contest and judges included Jennie Blohm and Angel Schumacher of Smokey Lake Maple Products, Bob Black of WIKB Iron River, WJFW Channel 12 Meteorologist Geoff Weller, and current Alice in Dairyland, Kaitlyn Riler. Lucky raffle winners were: first place paddle package Ed Staats of Sturgeon Bay; second place camping package Andy Frank of Oconto Falls; and third place lodging package winner Joch DeAngelo of Eagle River. 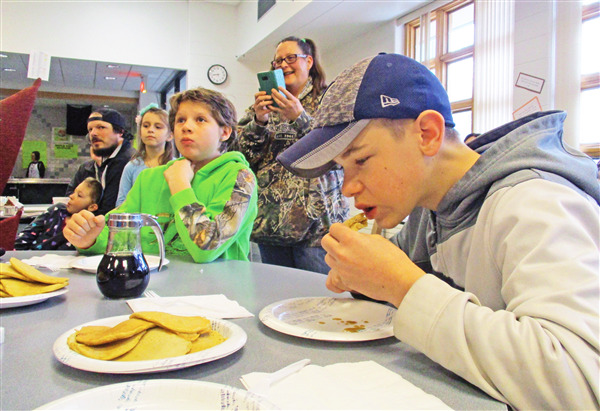 Winners of the children’s pancake-eating contest were 4-year-old Brady Kube of Eagle River and 11-year-old Samantha Guysick of Rhinelander.